duran2.net : most wanted original items only, no copies please! 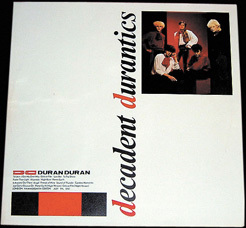 duran2.net / Private Collection always looking for any Duran Duran and related items. We would be happy to trade or buy anything in good to mint condition. Send us your list if you're interested. You can be sure, your Duran Duran stuff find the right place. Our current want list is incomplete and almost anything that we don't have is an interest of us. we are desperately looking to trade/buy concert ticket stubs from any duran duran concert dates including the solo project concerts of john taylor, andy taylor, the power station, warren cuccurullo, the devils. please e-mail us if you can help!